That and Hawaiian Eye were among my favorites, especially when it featured Connie Stevens (I still carry the torch), SIGH!! LOVED IT.AND YES,HE HAD A COOL GUN. The networks were full of P.I. shows back then.77 was my favorite. 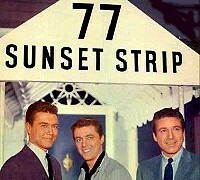 Connie Stevens...Kookie, Kookie...Lend me your comb...77 Sunset Strip...77 Sunset Strip...The memories!!! "The street that wears a fancy label, that's glorified in song and fable." Edd Byrne's hipster-parking-valet character inspired a hit single, "Kookie, Kookie, Lend Me Your Comb". Remember that?